Interleukin-20 (IL-20) is a protein belonging to the IL-10 family of cytokines. IL-20 receptor (IL-20R) and IL-20 are expressed in several normal tissue types, including the lung, skin, and kidney. 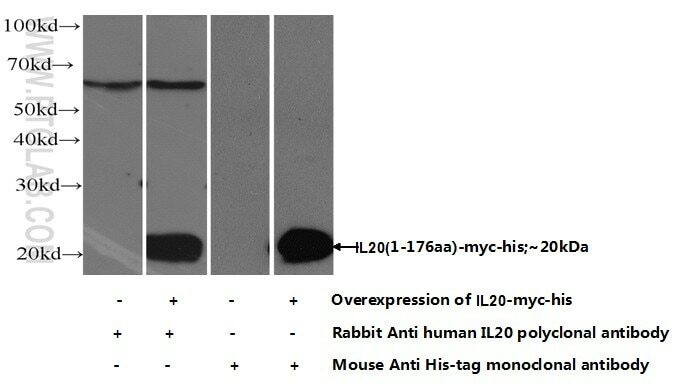 IL-20 is a cytokine structurally related to interleukin 10. IL-20 is produced by activated keratinocytes and monocytes and transmits an intracellular signal through two distinct cell-surface receptor complexes on keratinocytes and other epithelial cells. IL-20 can stimulate STAT3 activation in keratinocytes. IL-20 regulates proliferation and differentiation of keratinocytes during inflammation, particularly inflammation associated with the skin. In addition, IL-20 also causes cell expansion of multipotential hematopoietic progenitor cells. IL-20 is highly associated with potent inflammatory diseases such as psoriasis, contact hypersensitivity, rheumatoid arthritis, and atherosclerosis.